The lovely people from Book Publishing Company asked if I’d like to review some of their books. I know the company and already have several of their books so I jumped at the chance. They’re a community owned, independent book publishing company who publish books that “promote a healthful and sustainable lifestyle”. I asked them to just send me a sample of things – basically, to surprise me. The first book I looked at was Raw Food Made Easy. I own a couple of raw food books and find them quite interesting, but I don’t have a dehydrator and have never really been bothered to make anything raw except for salads. This book doesn’t need any special kitchen equipment that anyone who cooks a lot wouldn’t have – knives, blender, food processer etc. There’s a useful introduction and list of kitchen staples, and a section with useful techniques, such as soaking nuts. The recipes are split into chapters with breakfasts, dips and pates, soups, salads, salad dressing, sandwiches, entrees, side dishes and desserts. On a very sunny April day I decided to dip my toe into the water of raw food with Not Tuna Pate, served as a sandwich. I needed to plan in advance by soaking the nuts and seeds, but once that was done it was remarkably quick and easy to make. I enjoyed the method of using romaine lettuce instead of bread for the sandwich, and the juicy tomatoes worked well with the pate. It was a lovely healthy lunch – much more filling than I expected and I’d make it again for sure. I’ve no intention of going raw, but I really fancy trying the zucchini (courgette) hummus, the walnut pate, the mock rice pilaf, the carrots with Moroccan spices and the cucumber soup. 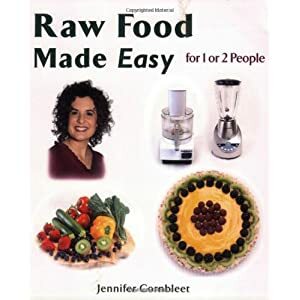 Overall this is a very approachable introduction to raw food and would help anyone incorporate more raw foods into their diet. Vegans should note that although none of the recipes include cheese or fish, there are several serving suggestions which use raw versions of them. Keep reading, because I’ve more Book Publishing Company books to review over the next few weeks!